The Joe Chithalen Memorial Musical Instrument Lending Library (Joe’s M.I.L.L.) has over 750 instruments and resources. 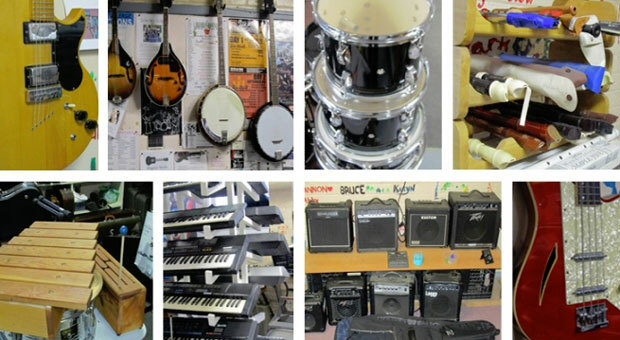 These include, but are not limited to, guitars, keyboards, drums, horns, violins, percussion, exotic instruments, amplifiers, and much more – and they’re all available to borrow ... free of charge! Tyler Flynn, the coordinator at Joe’s MILL, is happy to answer questions or help you find the right instrument to borrow. Joe’s MILL is a registered charity in Kingston, Ontario founded by musician, Wally High, in memory of his friend and bandmember, the late Joe Chithalen, who was a talented bass player in several well-known Kingston bands. Joe’s MILL operates in tribute to Joe’s love of music such that everyone who wants to can enjoy playing music as he did. Would you like to get involved with our organization? Please contact us if you have any questions. You can fill out an application form found here.